Join Casa de Tesoro and La Guitarra ver the Easter Weekend! 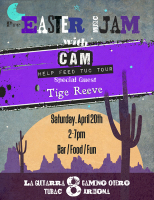 Local singer/guitarist, Cam and Nashville transplant, Tige Reeve will get the party going with songs from the '70s, 80s and 90 in a wide range of styles and genres. Don't miss this dynamic, energetic and entertaining collaboration! Bar and a Food truck featuring summer BBQ favorites. La Guitarra Event Space is located directly behind our art gallery, Casa de Tesoro which is located at 8 Camino Otero, Tubac, AZ.